The Harvest is in! Finally!! For the second year in a row I have helped my brother in law Eric Goerzen with harvest. This is the family farm where my wife grew up and comprises 1700 acres of high yield dirt. Eric took over farming the homestead years ago and has added to it both in size and equipment. Eric has also stepped up to and embraced the new agronomics and yield increasing technologies. It’s a well running business but requires a high level of commitment and just plain guts. The Bumble Bee in the field. possible to replace the two aging combines with one relatively new one. This was a big decision to make. The price of these new machines are quite high plus the complexity of the systems running them is on several orders of magnitude more sophisticated. Much like going from a 1970’s carbureted Chevy to a new computer controlled fuel injected BMW. Fortunately Eric is also a certified heavy duty mechanic so has a head start on understanding the inner workings. Another part of the equation when determining the need to purchase this new combine was the advanced age of Eric’s father and his father in law. Both gentlemen are dyed in the wool farmers and would rather meet their maker doing an honest days work on the farm than be put out to pasture. It was a tough decision, but one Eric had to make. 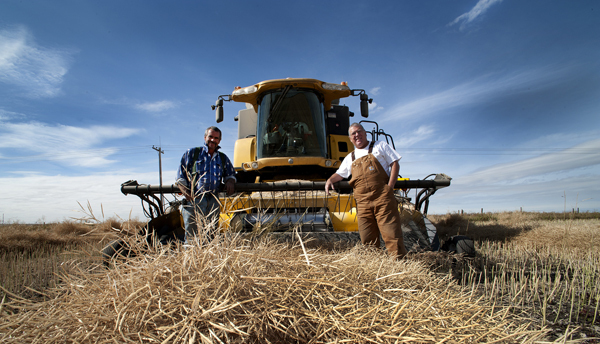 The New Holland combine Eric purchased, a CXR-40, is fully computer controlled. 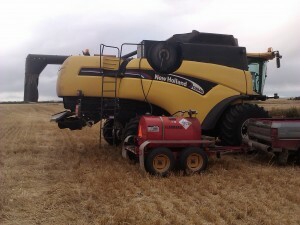 Almost all adjustments can be made from a screen in the combine. The driving compartment is very ergonomically well designed with sound deadening one of the major pluses. 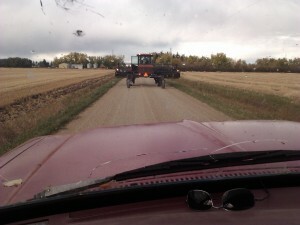 The downside of that is you can not hear what the combine engine and thrasher are doing. You have to rely on your in cabin alarms, screen readouts and the good ears of your truck driver. For old timers this is a huge leap as they are use to “driving” a combine and know what every noise and shake means. 750 liters of fuel every day. around a 50 ton machine. To put that into perspective a Centurion tank, the mainstay of the British and Canadian armies during WWII, weighs in at the same tonnage. Last year we were plagued with mechanical breakdowns. One in particular had us sidelined for a full week. The pressure was on! When the crop is ready you have to move fast. Every day counts. If a frost hits the grade of the crop can be reduced dramatically. Sometimes the crop can be so damaged it just doesn’t pay to bring it in, especially considering historically weak grain prices. The price of wheat has not kept up with the consumer price index. On top of that western Canadian producers are hamstrung by the Canadian Wheat Board. Just another government board that rewards the east (WCB does not apply east of Manitoba) and screws the west. Check out this link for stats collected by the American USDA to give you an idea of how tough it has gotten for farmers to make ends meet. What’s happening is the family farm is nearing an end. Forced out by the economics of big business. 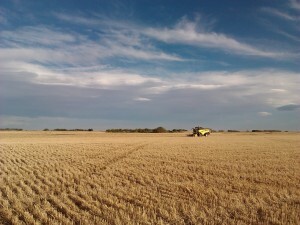 The only way you can make a living from grain farming is to cultivate 10’s of thousands of acres. All the input costs have gone up but the revenue side has remained flat for generations. the gear box on the auger tractor gave up the ghost. For the most part minor stuff. Just additional stress. It’s hard for most people to comprehend that an entire year’s revenue is taken in during one week! 51 weeks of blood, sweat and negative cash flow. If something goes wrong and the crop is a bust, well it’s not pretty. Many farmers feel that feeding the world is their mission. God put them on the planet to put food on our plates. They feel a real affection for the land they work. It’s almost like the land is another child of theirs. They nurture it, protect it, feed it and then feel a great sense of accomplishment when it repays them by bringing forth a great crop. I have seen farmers pick up the soil they farm and just rub it on their face. They seem to enter into a state of rapture as they smell the earthiness and feel the velvet texture. Most farmers, especially on the family farms, earn a meager living compared to business men and women who have to shoulder the same levels of stress and calculated uncertainly. But just try and take these sod busters off the farm! Thanks and thanksgiving all wrapped up in one. Thanks for the insight sensitive observations and as always wonderful pics. Love the one of you and Eric at the front of the combine. Wow! Never even thought about the damn thing breaking down when it’s do or die!